1. Physical Game: skills and techniques such as braking, steering, accelerating, where you look, and the line you drive. Of course, physical strength and stamina are part of this, as well. 2. Mental Game: the mental game covers many areas, from the ability to focus to mentally rehearsing and programming a physical skill, and from managing your state of mind to how to learn a track more quickly. Actually, there’s also the “mechanical game,” which is all about modifying and tuning your car (including installing new tires) to make it faster, but we’re going to ignore it in this article and just focus on the physical and mental factors. Why? Because unlike putting new tires on your car to make it faster, learning physical and mental skills never wears out! When I ask drivers what percentage of driving is mental versus physical, everyone agrees that performance and race driving is more of a mental game than a physical one. When I follow up by asking what they’re doing to improve in these areas, I get lots of answers about the physical game, but rarely much about the mental game. Why? Because most drivers don’t know where to start when it comes to developing their mental game. Okay, that’s not fair, not totally true. Most use visualization to mentally drive a track to prepare, and some have read about other aspects of the mental game, but it’s not something that many drivers (based on the thousands who I talk to each year) use in a deliberate, strategic and consistent manner. And most only scratch the surface of what can be done to improve their performance. That’s good news for you, as it’s an opportunity to be better than those who ignore the mental game. The last time you were at a track, of all the talk with other drivers, how much of it was spent discussing the line around the track? How much did you talk about track conditions? How about where you all brake for a corner? And whether anyone is able go full throttle through a section of track? In other words, what percentage of talk at the track was about the physical game? Now, how much time was spent discussing ways to help your brain process information faster? Or what you can deliberately do to change your confidence level? How you can learn a track faster? How you can sense the limits of your car better? How you can make better decisions on the track? Where, when, and how can you use mental imagery more effectively? I know you who read Speed Secrets Weekly think about and do more with the mental game than most. And that gives you an edge. Just like buying a treadmill, you have to use it to see the benefits of it, though, right? I know, I know…darn, I wish treadmills would do the exercise for me! Buying into the benefits of (and using) the mental game was a gradual process for me, but one that started a long, long time ago. And it inspired a lifetime of commitment to using, and sharing, the mental game with others. Okay, story time…. When I was fifteen years old or so, I went into my school’s phys ed teacher’s office to drop something off. On a shelf behind his desk was an “Athletics” magazine with an article about visualizing. Now, this was a long time ago – 40-ish years ago – and sports psychology had barely been invented! But research had been going on for many years about the effectiveness of visualization for athletes, with much of it conducted to help Olympians. So, I “borrowed” the magazine, taking it home and reading that article over and over again. At the time I was involved with a lot of sports, but tennis was my main focus (when I wasn’t going to a race track with my dad, thinking about how I was going to race at Indy one day). I began using visualization to help my game. Every night before bed, I would hit a hundred or so serves – in my mind. I’d practice my forehand and backhand, and my volleys. All in my mind. In a matter of six months, I went from barely making my high school’s tennis team, to being the number one player, and captain of the team. Over the next couple of years, my game progressed faster than many who had been better players than me, even though I spent less time physically practicing. I experienced the benefits of visualization as a tool to help me develop my skills. But it didn’t end there. Perhaps because I had a pretty good imagination, I begin visualizing more than just physical skills. I visualized a different mindset – a “killer, dominant” style for when that was the best way to beat my opponents, and a more patient, steady mindset for when I was trying to change up the game on an aggressive opponent. I used visualization to rehearse what I’d say to my teammates and coach. I used it to build my confidence. I used it to practice regaining my focus after a frustrating point, set or match, or after some form of distraction. I used it to manage anger, and even my response to feeling tired and worn out. And something I discovered accidentally was that if I imagined not only a visual image in my mind, but also moved my body, and heard that beautiful sound a tennis ball makes when popping off the strings of my Dunlop Maxply racket from a perfectly punched forehand volley for a winning shot, it worked even better. Oh, and I’d always start off by imagining the smell of a freshly-opened can of balls…yeah, I can smell them right now, while I type this sentence! In fact, I’d gone beyond visualization, and started using mental imagery (using as many senses as possible) to help my entire mental game (and not just physical skills). As my career goals switched from pro tennis player to pro race driver, I continued to use mental imagery. Rarely does a day go by, some 40-ish years later, that I don’t do some amount of it to help me improve my performance in whatever I’m doing. Mental imagery… it’s not just for breakfast anymore! It can be used for programming skills and techniques, for sure. But it can, and should, be used for programming your mental game. So where do simulators fit into this story? 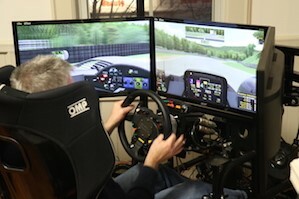 If you think of the physical and mental games along a spectrum, then simulators fit in between. They’re a fantastic tool to develop physical skills, as well as your mental game. The simulators we used this past weekend for the workshop were what I’d call “high end” units, as their prices are in the tens of thousands of dollars range. But everything I’ve mentioned above can be accomplished with a simple simulator costing a few hundred dollars. In fact, while it’s harder to develop your physical skills on a low-budget machine (because the realism of the controls are not as accurate as they are on the high-end ones), every single aspect of the mental game can be developed on the simplest of simulators. 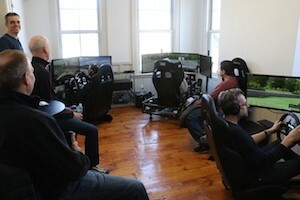 Okay, so I’m a huge proponent of using simulators. However, there are some limitations and negatives. When you crash on a simulator (noticed I said “when,” not “if”), you’ve just programmed crashing. A common mistake many drivers make when they first start using a sim is they drive too fast, too soon. They don’t give themselves time to acclimate to the “environment” of driving a sim, and then end up crashing and complaining that it’s not realistic. I strongly recommend taking your time, getting comfortable with the controls, and the feel (or lack thereof) of the sim unit you’re on. Once you feel comfortable, then gradually increase your speed. Note: I could go on and on about the mental game, and the use of simulators… but my flight is landing in Orlando. So, until my next flight (and after learning more from conducting a workshop of some type for drivers somewhere)…have fun working on your mental game, and using simulators as a tool to help you do so.